When I first left my job to go freelance, there was lots of talk from my family and friends about wearing PJs all day and not showering. Apparently, the freelancer’s uniform is sweatpants, a greying t-shirt and serious bedhead. Quelle horreur! I do find myself automatically reaching for the more comfortable, casual pieces in my clothing collection – why waste a printed jumpsuit and heels on the postman? – but sweatpants, PJs and things that could be described as ‘loungewear’ are still firmly banned from my wardrobe. Is this as close to a housecoat as you can get? Probably. But at least it’s not pyjamas. Oooo love that cardigan! Looks so comfortable. I love what you’re wearing so comfortable! The cardigan looks great for wrapping up in, very snug! I’ve been off work for the past three days, which is a big rarity for me, I’m usually lucky to get two days off a week! As you know I work from home, I went through a phase of wearing Mr Thrifty’s sweatshirts and just my knickers – I kept a pair of leggings by the front door incase someone knocked. The shame huh? I now tend to wear a lose fitted dress and a slouchy cardigan. I want to be ready to run out to coffee with friends or contacts without worrying about getting changed. My ASOS spotty jersey trousers and a baggy t-shirt plus a cardi. I might as well be in PJs. I love your outfit! The cardigan is cool! 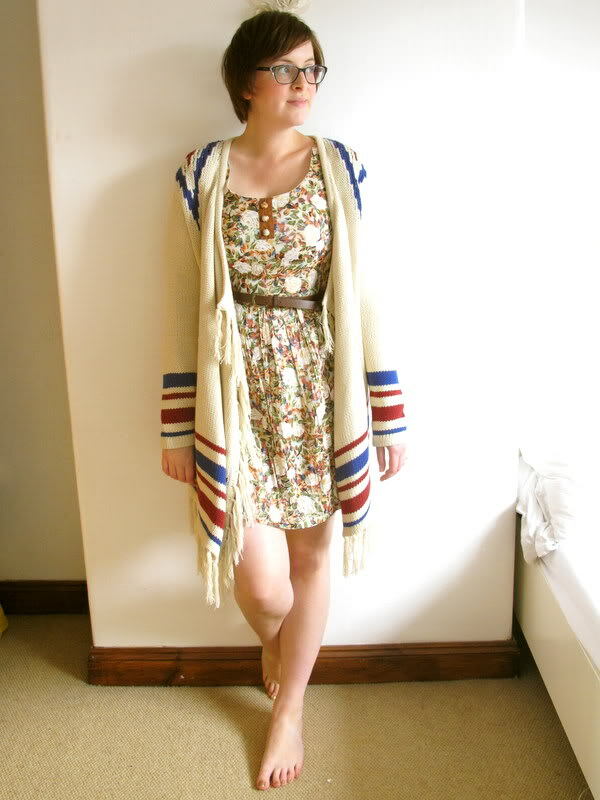 Lovely outfit – I really like the cardigan! A very cool housecoat methinks! When I was a student and completing my dissertation at home I would often slob about in pyjamas and just jeans & a t-shirt all day. Or a uni hoodie. I found it made me unproductive though and I worked better when I was dressed smartly and forced myself to go into the library so I don’t think I would be very good at working from home haha. That cardigan looks sooo cosy! Today I literally haven’t got out my of my pyjamas… ahem . But usually, I find dressing with a purpose makes you feel just that little bit more productive and on task. That’s my plan for tomorrow anyways! Oh that’s so weird! I was going to drop you a line and ask how the whole freelancing thing was going and ask whether it was easier or harder to make an effort with clothes. As a freelancer myself I have stopped wearing really smart clothes that used to wear at the office but it’s still nice to make a bit of an effort for myself. Your cardigan rocks – love it! I tend to wear shorts and a wife beater. I love having my legs out! If I get chilly I throw on anb oversized hoodie. 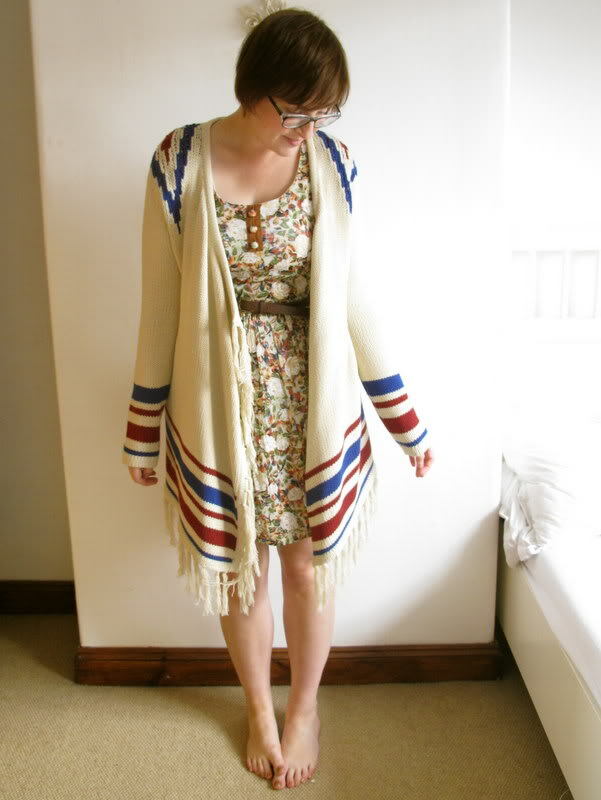 Your cardigan is fab, it has a feel of a poncho/mexican blanket with the comfort and style of a proper cardi! Looks brilliant. Lovely dress. I have good intentions whenever I work from home (not very often) but usually find I get really cold and have to put on cosy sweaters. I’ve got six weeks off over summer, and if I’m not leaving the house I tend to stay in my pyjamas. I had a real moment of shame with a courier the other day – pjs at lunchtime! I am forcing myself to go at least as far as the supermarket every day if I’ve nothing exciting on, so I get properly dressed. I would be so tempted to stay in PJs but then I think getting dressed everyday would make me a lot more focused. I do get in my PJs as soon as I get in though… ha. Thanks for all your comments guys – for everyone asking about the cardigan, I picked it up about two weeks ago in the Topshop sale. It was £20! I slob out at home, I wear my baggy grey nike joggers and a vest top. Not the most attractive of combos I know! I adore that cardi, is it current stock? I need it in my life if I can ever afford to shop in Topshop again! Cool cardi, comfortable and fashionable! I must confess to owning sweatpants, but they’re only used in emergency cases of being ill or having a bad day and needing comfort! On the days I’m working from home (part-time artist) I pretty much have to dress in old jeans and tshirts as I’m guaranteed to get paint on them! Love your sweater!!! Love the tribal feel to it! Wow that is one incredible cardigan. You look fabulous. 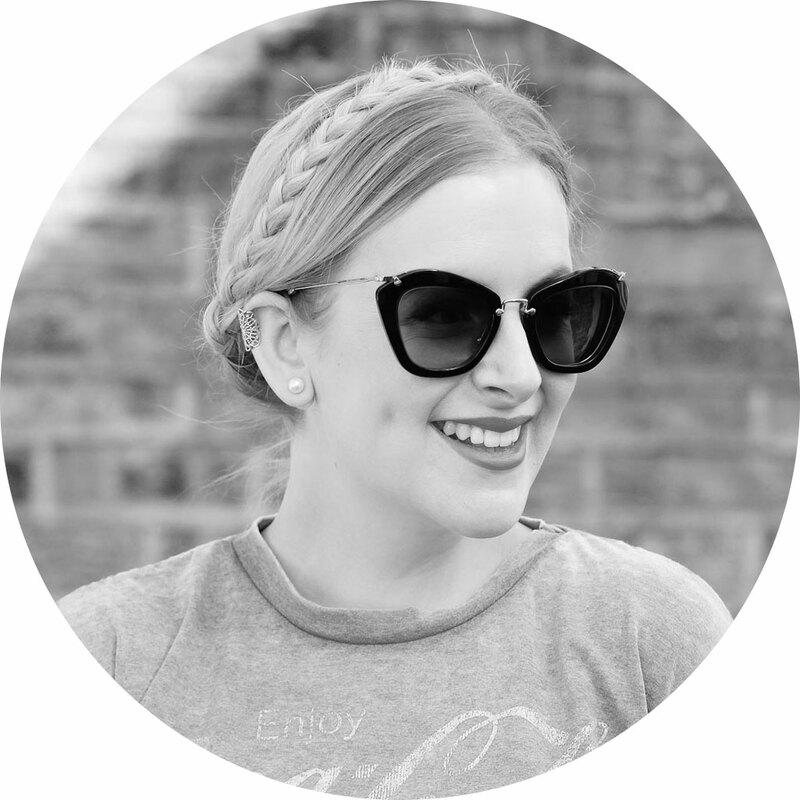 I’ve never commented on a blog before but I love that cardigan so much I just had to say something!! Love your cardigan by the way, gorgeous!